It’s Tuesday, so I must have a track workout this morning! Lately the schedule seems to have track workouts on Tuesdays and Fridays, strides following easy runs on the days in between, and a long double-digit-mileage run on Sundays. This program seems to be working because I keep shaving the seconds off of each workout and I’m really seeing improvement! Which is good because this Friday I will be competing in my first indoor track race of the season: 3000 meters (just under 2 miles). We race at 7,000 ft altitude, where the air is deprived of oxygen and times are a little slower than they would be at sea-level. Therefore we have a “conversion” time adjustment for every distance that has been created to better compare race times from Mammoth to those from Malibu. For instance, I ran a 5k indoor track race last year at 7,000 ft altitude. My real time was 18:52, but was adjusted to be 18:02 with the conversion chart. A few weeks later I ran a 5k at sea level in 17:50. So the conversion is more of a guide. We have to keep this in mind when we run work outs up here. Trying to keep “mile race pace” for a track workout is a little slower than it would be at sea level. 12 x 400 meters to be exact. (For those not too familiar with track/metric distances, 400 meters is one lap around a track which is 1/4 mile). 90 seconds rest in between each interval. Start out at 5k pace (about 85 seconds per 400 meters) and gradually speed up through out the entire workout, finishing anywhere between 70-74 seconds. Intervals allow you to run at a faster speed than a straight 30-minute run. Varying between bursts of speed and rest boosts metabolism and builds fast-twitch muscles. The twelfth interval should be the fastest! I love these types of “progression” workouts; it really stresses control. When you start out, you feel fresh and you want to go faster. But you have to run smart to have enough energy each lap to shave off a second or two. 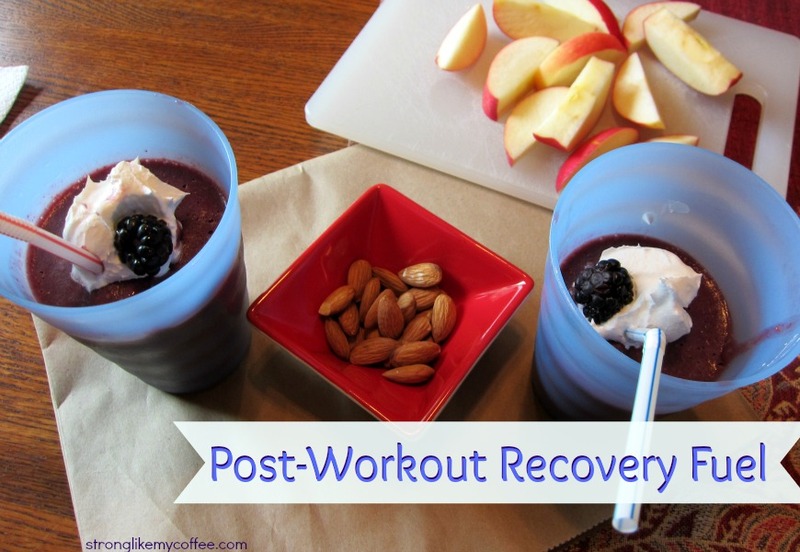 After this long workout, recovery is SO IMPORTANT. Especially considering I will be racing 3 days later and need to be free from soreness and have plenty of energy. Post-workout recovery meals (along with sufficient cool-down and stretching time) are top priority if you want to keep lactic acid to a minimum and reduce soreness. I’ve always heard that chocolate milk was a perfect recovery drink. One of the track meets in high school even had cartons of chocolate milk at the finish line for racers! However I recently read an article pointing out that chocolate milk contains a significant amount of high fructose corn syrup. After a little research I learned that 1 cup of chocolate milk contains an incredible 32 grams of sugar! Not to mention an equal amount of fat as protein – a measly 8.6 grams. I feel like we can do much better than pour that amount of sugar and simple carbs in our body after an intense workout. Smoothies are delicious, healthy and super easy to make. I’m a fan of popping them in the freezer for half an hour to make them extra thick, but since recovery fuel should be taken in within 30 minutes of a workout, we might want to fore-go this step. You can always add in some berries, cinnamon, wheat germ, almond butter, or whatever else your favorite smoothie ingredients are. 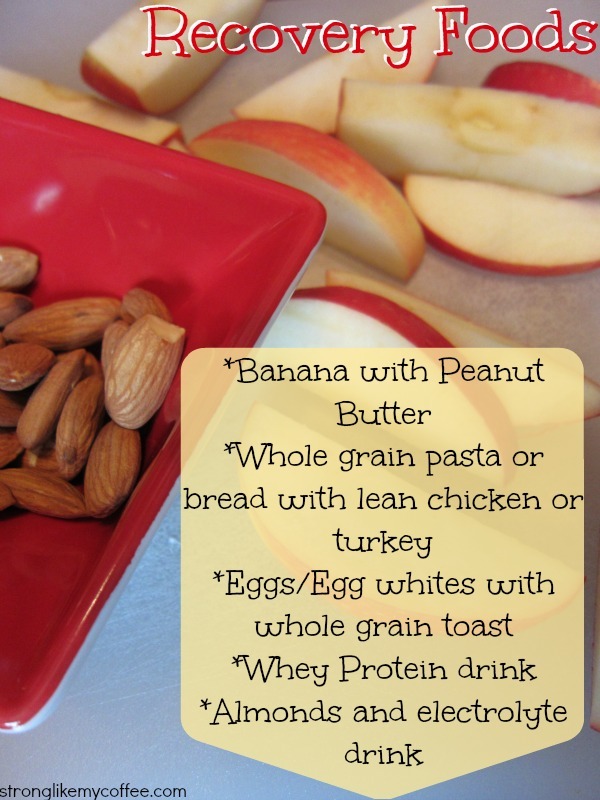 Just make sure your post-workout recovery snack/meal is not completely undoing your workout. If you are working out to lose weight, you’re not going to want to end a 4 mile run with a 1,000 calorie smoothie so remember to keep it light on the nut butters and flavored protein powders, and go for Greek yogurt over a Clif Bar. Posted on February 5, 2013, in Fitness, Healthy Habits and tagged fitness, health, recovery fuel, smoothies, Track, Workout. Bookmark the permalink. 4 Comments. Peanut butter is probably my favorite thing to eat post-workout. I’ll take it on toast, a bagel, oatmeal, pancakes, whatever. Peanut Butter is my favorite thing to eat…….ever.